I wanted to make a special little gift for a special little girl. So what do little girls like … hmmm … pink, flowers, jewelry … yes! Since my bracelet is for a little girl, I only made 5 motifs. Make the number you would need to fit around the wrist of your intended wearer. Here is the pattern to work the flowers, but see below for different joining options before you get started. 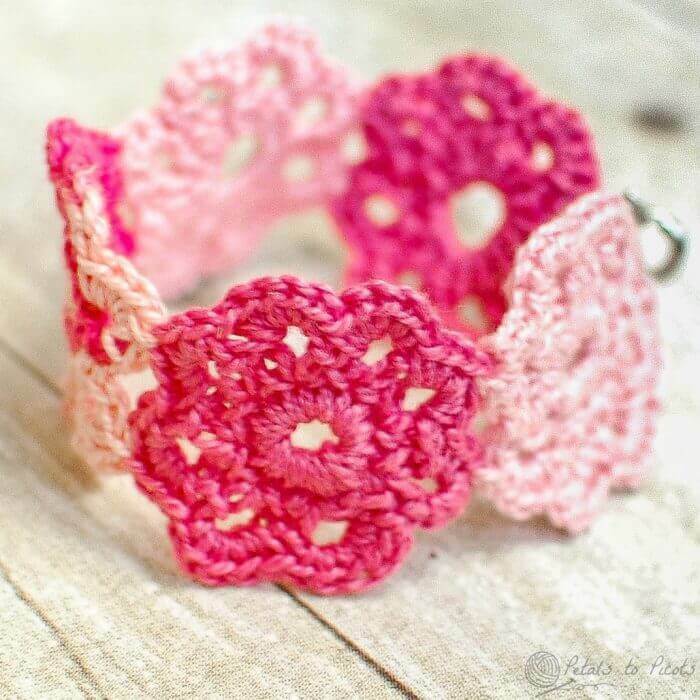 To join the flowers into a bracelet, you can simply make all your motifs and then sew them together with a needle and thread or you can use the join as you go method (JAYGO). Round 3: Ch 1 (does not count as st), *work 5 scs in next ch-3 sp, repeat from * 5 more times, **in next ch-3 sp [work 2 scs, drop loop from hook and insert into 3rd st of petal on the flower you want to join it to and pull through the loop, continue working 3 sc in same ch-3 sp], repeat from ** for final petal, join in 1st sc of round — 40 sts. Using a sewing needle and your thread, sew bracelet closures to each side of your bracelet. Weave in all ends securely. I am loving this pattern! However, I find the JAYGO method a little confusing. How do you make the second petal? As in, do you chain 6 and then continue as usual? Hello! This is an adorable Pattern! I love it and look forward to making it for some special little ladies in my life! Would you mind if I made some to sell at vendor events? I would add a tag saying who wrote the pattern with this URL. Hi De 🙂 You are most welcome to sell any of the bracelets you make … good luck! How does it go on? Does it stretch a little or do you use some kind of closure such as a loop and ball, etc.? Hi Kara, I love your bracelet. And it’s so nice you can make it very quick. It inspired me to make an orange bracelet, for Kingsday here in The Netherlands. I’ve also added your link to my blogpost (http://hipmethaken.blogspot.nl/2015/04/armband.html). If you do the JAYGO, after you finish the first petal do you just Ch 6, join with Sl st in furthest ch from hook to form a ring and then do round 1 and 2? I am a little confused on the joining, thank you! 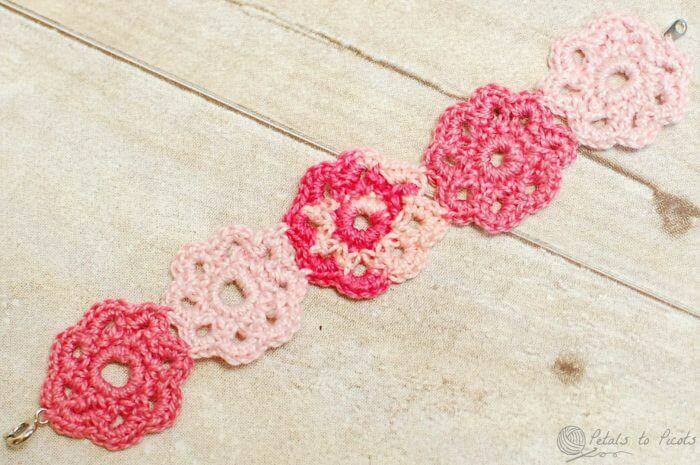 I love this bracelet pattern -so live and perfect for a girl. Def. going to make it! Thread crochet has always intimidated me. Then I saw this. I wanted to try making one to see if I could do it….besides what great surprise gifts for friends if I could. I have already made and joined two motifs (I hate joining things and have never done join as you go) with the join as you go method and I love, love, love how easy this is!! I can’t wait to get more thread in more colors than just the beige I had on hand! I am going to make a ton of these and keep them in my bag to have something to work on in short spare moments of time that is otherwise wasted when I’m running errands. Thank you so much for the free pattern and (for me) easy to follow instructions. If I do make some for my Etsy shop I will make sure to credit this site. You fantabulous! Hi! 🙂 I am trying to make this pattern. After I follow the first step i.e. doing 16 single crochet into a ring, I am having trouble in visually identifying all the 16 stitches in order to do the next step i.e [the sc, chain 3, sc] in alternate stitch. Since the central hole is small, won’t the 16 stitches overlap on each other? Please advise 🙂 Thanks! Hi Aditi 🙂 The stitches may be close together but they shouldn’t overlap each other. If it helps, perhaps place a stitch marker to help identify the stitched you need to work in. Hope that helps. Hi Kara! Thanks for your response. I tried by placing a marker. I reach that marker after doing 12 stitches. The remaining 4 stitches are on the top of the first four. I love this. I wish I could crochet better. Hi, I love this bracelet! I am planning on opening an etsy shop. Do you mind if I sell the finished product? If i so, am I supposed to link back to you? I’m new to selling and I didn’t see what your preference was. You may absolutely sell your finished bracelets from the pattern. I would love if you could credit my site with the pattern (www.petalstopicots.com). And if you send me the link to your listing, I would be happy to promote it on my Facebook page as well. I wish you much success!! How much thread does it take to make one bracelet for a child and an adult? I need to make two children and one adult so I need to know how much to purchase.. Thanks Kara for the reply! It does make sense! I just liked your facebook page, I will post a picture when done. Thanks again. Thanks for the pattern, very cute. I tried twice but ended up with 6 petals instead of 8. I don´t see how I can repeat 7 times on to the initial 16 stitches, since every repetition hold 3 stitches ( I understand that from *work [1 sc, ch 3, 1 sc], skip next st, rep from * 7 more times). Then if I ‘use’ 3 stitches 7 times I would need 21 initial stitches…OMG, I hope this makes sense…the thing is, I always end up with a hexagon instead of a flower..
Hi Marta 🙂 Let me try to help … Stitches within brackets indicate a group of stitches that need to be worked in one place. So, [1 sc, ch 3, 1 sc] is all worked in 1 st, then the next is skipped. You do this a total of 8 times and it should cover the 16 sts from the previous round. Make sense? thank you for sharing. i love it. i already pint it. Kara, this is sssssoooo gorgeous. I’m going to show it to my daughter when she gets home….I think she’d love a bracelet like this! This was adorable and I immediately grabbed my thread! I made one and your pattern reads beautifully! Thanks for sharing! May I post your picture of the bracelet along with mine on my Facebook page with a link to your site and the pattern? I am still learning about how to do the Facebook posting, but I did get the picture posted of my bracelet and placed a nice reference to your page. Thanks much! I enjoy your site and study it constantly to try to learn more about sharing about our craft. I hope to bring people together in my area who love to needlecraft and build a community of sharing. Someday I’ll be brave enough for a blog, for now the Facebook page is my first step. Best wishes! Kara this bracelet is so elegant! I love how your center flower shares the colors of your other flowers! What a sweet bracelet!! Pinned! Hi, I’m a crochet newbie. Would you mind translating how to do the following: work 5 scs in each ch-3 sp around. Hi Kat 🙂 I will try to clarify. Ch-3 sp refers to the space created from making 3 chains in the previous round. So, you would work 5 single crochets in that space. Make sense? The way this works in crochet, is you take that ch-3 chain from the previous round, and you work 5 scs into that chain. When I do something like that, I work the scs (or whatever stitch) by sort of wrapping them around the chain. Instead of sticking the hook into the chains themselves, I catch the working thread under the chain. Make sense? It totally hides the chain and creates an interesting look.